Compatible with select Nest thermostats. Including Nest Learning Thermostat, 3rd Gen and Nest Thermostat E.
Wireless. Bluetooth Low Energy connection. Long battery life - Works on CR2 3V lithium battery (included) with up to 2-year lifetime. Up to 50 feet range. Allows easy placement. Take control of your home's heating and cooling without lifting a finger with this thermostat, which learns your habits and adjusts to automatically regulate your home's temperature based on your schedule. The Nest Leaf feature alerts you when you choose a temperature that's energy efficient. System Match activates features that work with your specific heating and cooling systems, and connects to most 24-volt forced-air, heat pump with AUX, dual fuel and radiant systems. Convenient Wi-Fi capabilities offer a secure and reliable connection. Download the free app from iTunes or GooglePlay and adjust your thermostat from your smartphone, tablet or laptop, even when you're miles away. Farsight illuminates the thermostat's display when it spots you across the room. Within a week the Nest thermostat starts programming itself to the temperatures you like. Away mode automatically switches to an energy-efficient temperature when you're not home. Different features follow your activity, manage humidity, and keep an eye on the weather to provide a custom climate for your home. Track how much energy you've used and follow tips that will help you conserve. Make an energy-saving temperature adjustment and the Nest Leaf will notify you immediately. Monitors your equipment, sends service reminders and tells you if anything is not working correctly. You can also be alerted if your home's temperature gets dangerously hot or cold. The Honeywell Home CG512A1009 Large Thermostat Guard provides the ideal defense in preventing others from tampering with your heating and cooling options. An elevated peace of mind is established as users will no longer have to worry about any unauthorized access that may result with adjustments or damages. Installation is near effortless and the Guard will fit on all Large Sized (8. 25" W x 5. 75" H x 2. 75" D or smaller) Honeywell thermostats and a host of others. The actual casing is chemical and UV resistant which allows users to deploy their cover all year round without the slightest concern. A steadily constructed key and lock function will perform admirably as a versatile defense. 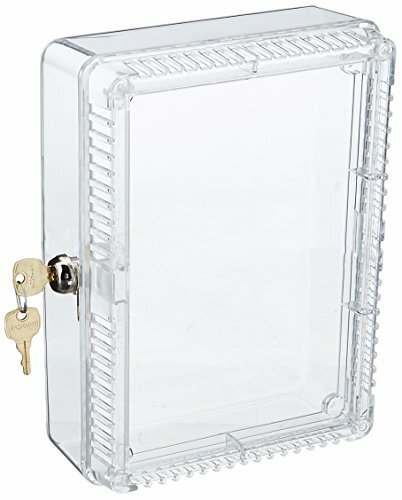 Clear plastic cover that resists yellowing; The Honeywell CG512A1009 Large Thermostat Guard provides the ideal defense in preventing others from tampering with your heating and cooling options. Made from hard, durable ABS, the Wall Plate Cover is made to last and add a uniform splash of color to the thermostat's surroundings. 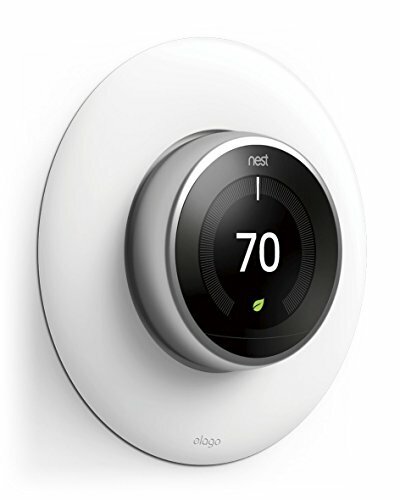 the plate is curved to act as a natural continuation of the Nest Learning Thermostat's design. 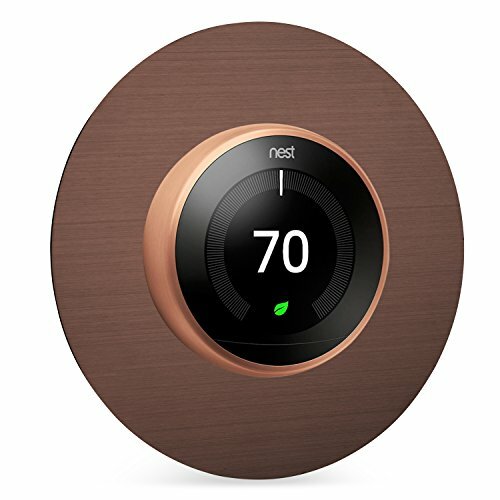 DESIGN: The design of the Wall Plate Cover was inspired by the design of the Nest Learning Thermostat; the plate is curved to act as a natural continuation of the thermostat's design. Color matches perfectly with Nest Learning Thermostat. 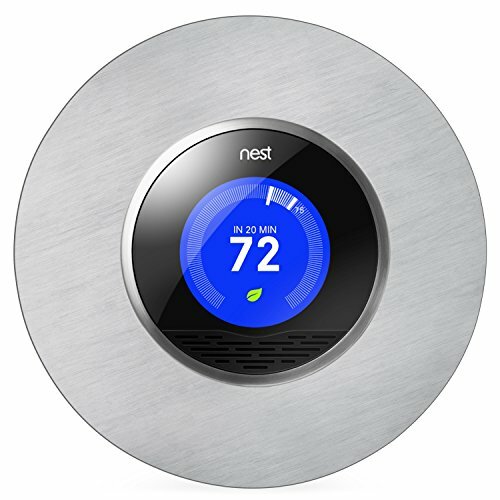 FORM - Beautiful Matt Stainless Steel Nest Thermostat Cover Plate 6" in Diameter. 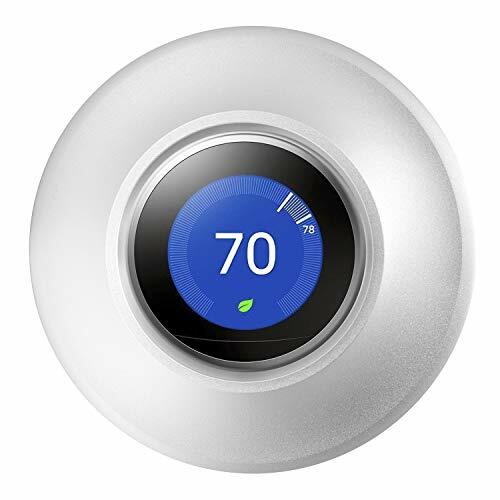 Custom-made Stainless Steel Matches the finish of the 2nd and 3rd Generation Nest Thermostat and Nest Thermostat E.
FUNCTION - Easily cover up the holes of your old thermostat. Fits All Generations of Nest Thermostats. Easy Installation Saves Time VS. Painting or Wall Patching. 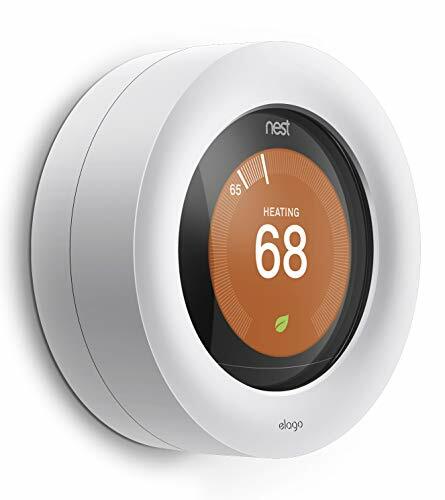 WASSERSTEIN SAVINGS FOR NEST CAM ACCESSORIES - Realize huge savings when you buy our Nest Thermostat Wall Plate together with our other Nest Cam Accessories - Use discount code 'NestDeal' at the checkout. Other Nest Cam Accessories include our colorful silicone skins to protect and camouflage your Nest Cam Outdoor (ASIN: B01MDLZC4Q / B01MA3RYJ9 / B01MCTHGMI) or our Nest Cam AC Mount in black and white for Nest Cam Indoor (ASIN: B01G9MNH6Q / B01HICIXS8). Well milled solid piece of metal with a good finish,not plastic materials.Excellent fit and good quality,extremely easy to install. Rest easy high quality metal materials that created the item to use last a lifetime. 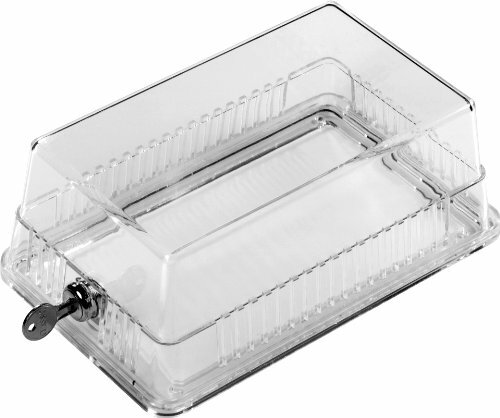 Friendly tips:1.Nest will come with plastic rectangle wall plate. 2.On a flat wall no need using Nest metal mounting plate, it is perfectly matched. If used Nest metal mounting panel, there maybe a millimeter gap with the wall. 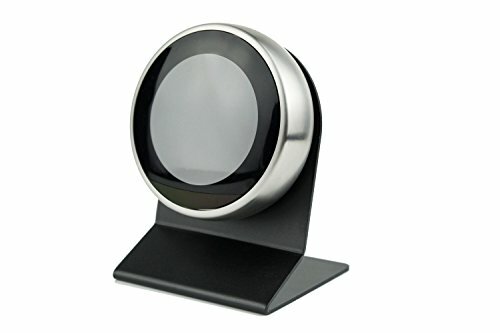 NOT PLASTIC MATERIALS Nest Thermostat Itself comes with a white Plastic Rectangle Wall Plate,but our plate has an anodized finish with Unique3D stereoscopic pattern design, into more fashionable element, let your Nest Thermostat full of administrative levels and modern look that can't be beat. FINGERPRINT RESISTANT Cover aluminum oxide into dense color protective film,never worry that leaving fingermarks. EASY INSTALLATION easily installed to make your Nest Learning Thermostat looking much better than before! No need to paint or do any remodeling work to install the plate. 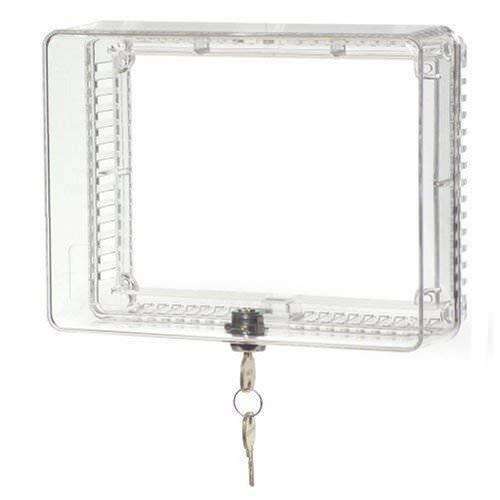 SIZE&PACKAGE Diameter: 5.9 inch/15 cm,Weight: 0.5 lb/230 g.please have a check whether it can cover up the previous hole or mark.With a silver wall plate cover, two screws and stoppers; NOTE: NEST IS NOT INCLUDED! 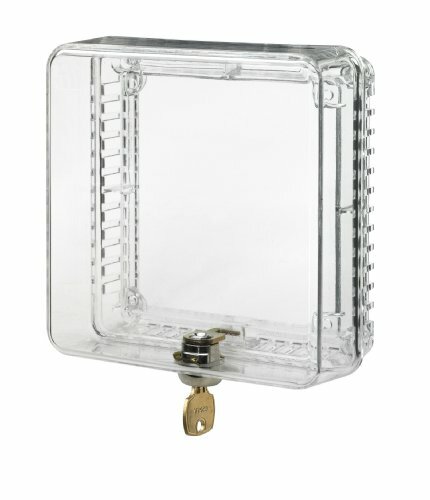 Locking thermostat guard to protect your thermostat from unwanted tampering. Precision Crafted and Hand Dressed Ecobee4 Thermostat Cover Plate in diameter-Square-Fits Ecobee4 Smart Wi-Fi Thermostat.NOTE:Originally equipped with a bracket, unlike the original bracket, our product bracket is better and stronger.Note:Ecobee4 Not Include. 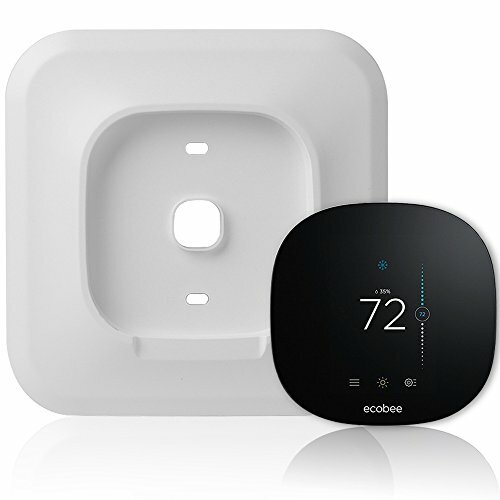 This one of a kind Ecobee4 Smart Wi-Fi Thermostat mount offers an opportunity to showcase your smart home technology while allowing it to fluidly blend into the style of your home. Water transfer printing! Nice way to cover up imperfections around your Ecobee4 Thermostat. Easy Installation Saves Time VS. Painting or Wall Patching. Wall Plate Color:White . Classic beauty meets contemporary tech. Looks great and gives your Ecobee4 Thermostat a warm and classic, retro meets contemporary look that it could never have on it's own. 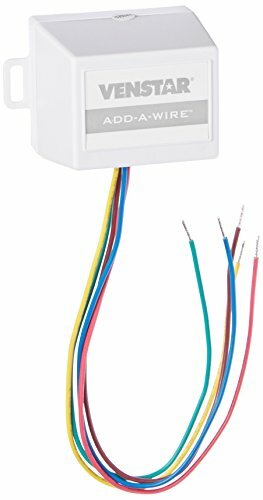 In applications where additional wiring cannot be run to your programmable digital thermostat, the Add-A-Wire accessory can be used to add a wire to the thermostat. 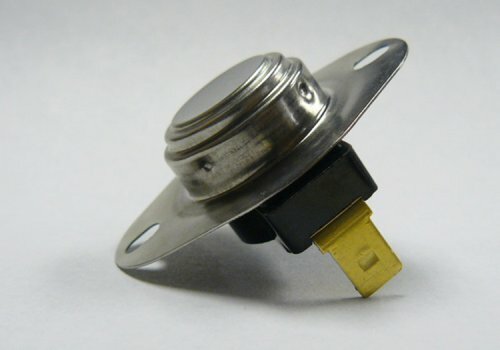 The accessory can also be used for fixing a broken wire, to make one thermostat work like two, to add cooling to a heat-only system, or to add a common wire to a 4-wire system. Please note that the green and yellow wires of the Diode "Y" may not be connected to the R or C terminal of the thermostat. (The function of a diode is to allow current in one direction and to block current in the opposite direction.) 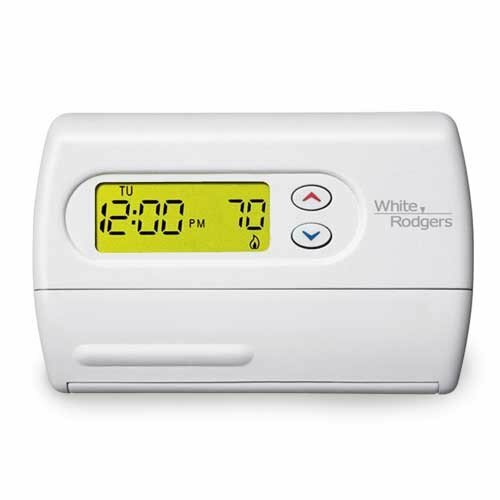 This accessory works with the Venstar 1-Day Programmable Digital Thermostat, the 7-Day Programmable Digital Thermostat, and the 7-Day Programmable Thermostat, Dual Fuel (each sold separately). STANDARD FEATURES: * Includes Yellow, Green, Blue wire splice (directionally sensitive) * Includes 4 wire nuts * Wires running from Add-A-Wire accessory are 9 inch long * Maximum distance for Add-A-Wire using 18-gauge wire is 100 feet * Makes one wire work like two * Mounts inside equipment (not for outdoor use) * For use with 24-volt HVAC systems * Cannot be used as "R" power or "C" common wire. Great for installations with a broken common wire or retrofits. Easy to install, Easier than running new wire. Allows 5 wire thermostats to use only 4 wires. Also allows 5 wires to work like 6 wires. 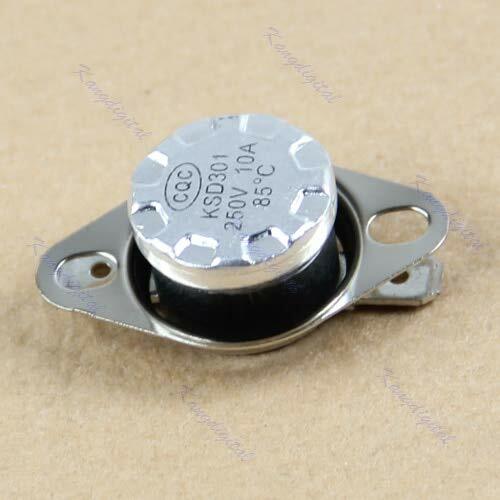 Compatible with any 24VAC thermostat signal wiring. NOTE:Originally equipped with a bracket, unlike the original bracket, our product bracket is better and stronger. Precision Crafted and Hand Dressed Ecobee3 lite Thermostat Cover Plate in diameter-Square-Fits Ecobee3 lite Smart Wi-Fi Thermostat. 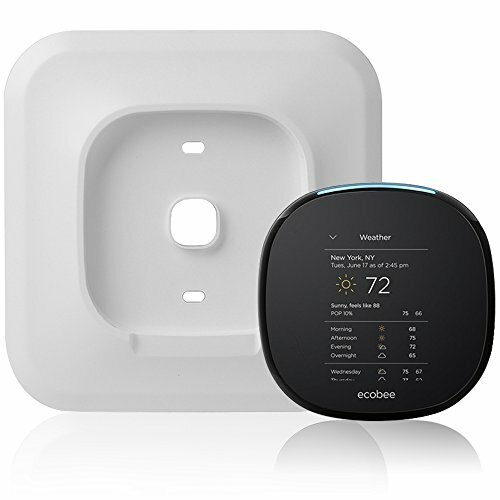 This one of a kind Ecobee3 lite Smart Wi-Fi Thermostat mount offers an opportunity to showcase your smart home technology while allowing it to fluidly blend into the style of your home.NOTE:Originally equipped with a bracket, unlike the original bracket, our product bracket is better and stronger. Water transfer printing! Nice way to cover up imperfections around your Ecobee3 lite Thermostat. Easy Installation Saves Time VS. Painting or Wall Patching. Classic beauty meets contemporary tech. Looks great and gives your Ecobee3 lite Thermostat a warm and classic, retro meets contemporary look that it could never have on it's own. The standard UL approved 2511 series " bimetal snapdisc thermostats are capable of switching high-current applications over precise temperature ranges. Originally designed and manufactured by Honeywell and Elmwood Sensors. Now manufactured by Senasys. Sealed and gold versions are also available for unique applications. UL Approved up to 250 VAC and 25 AMP resistive load. 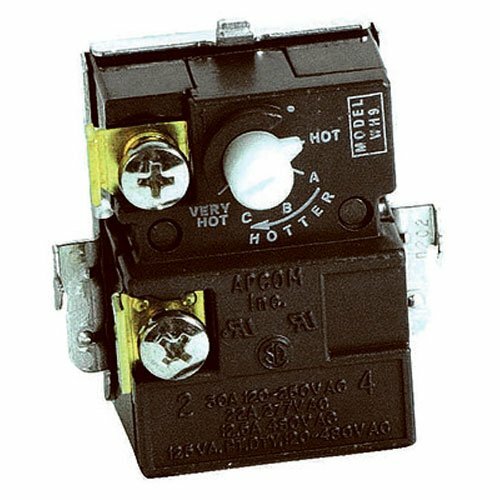 Rated for environmental conditions up to 350 F.
Temperature switch will last for over 100,000 operations under normal usage. Brand: Senasys | Manufacturer: Senasys, Inc.
FORM - Beautiful Matt Copper Nest Thermostat Cover Plate 6" in Diameter. Custom-made Stainless Steel Matches the finish of the 2nd and 3rd Generation Nest Thermostat and Nest Thermostat E.
Especially custom designed mount for Nest Thermostat 3rd, 2nd and 1st Generation. High quality Aluminum Alloy material with sand blasting oxidation process technology. Perfect angle to enable the nest to track everyday movements and create personalised heating schedule. For the stand and bolts only, not the cable or the nest backplate or device. 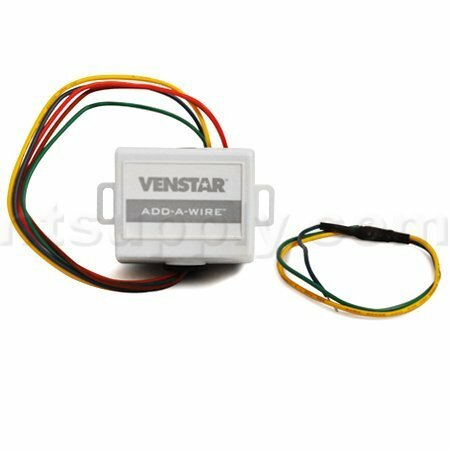 In applications where additional wiring cannot be run, the add-a-wire accessory can be used to add a wire to the thermostat. The accessory is also used to fix a broken wire, to make one thermostat work like two, add cooling to a heat only system, or add a common wire to a 4-wire system. made in United States. Manufactured by Venstar. The Emerson 1F86-344 thermostat offers versatile features like permanent memory backup and backlit LCD display. 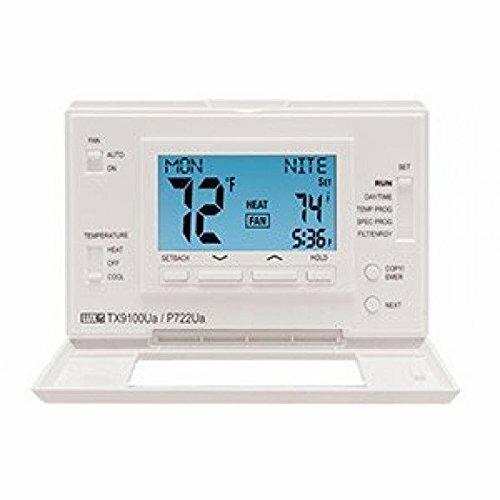 This non-programmable thermostat works with most single-stage heating, cooling and heat pump (without aux) systems. Plus, with precision control of plus/minus 1 , this thermostat puts control at your fingertips. *Not compatible with electric baseboard heat and some other systems. HOME PROTECTION- Keep your Nest Thermostat or Thermostat E guarded from children's reach or any other risks at home. PUBLIC PROTECTION- Guard your thermostat from being misused or stolen by securely locking it with the elago Nest Lock. 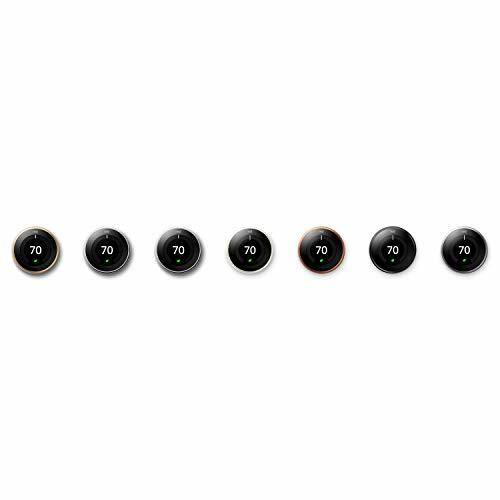 DESIGN: Did you know that the Nest Thermostat has sensors? The elago Nest Lock cleverly protects without interrupting these sensors. 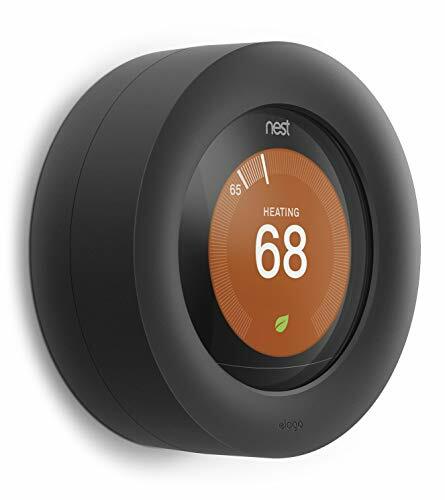 It keeps true to the simplistic and modernized feel of the Nest Thermostat. EASY INSTALLATION: Simply slip on the cover to complete the installation. No need for remodeling or readjustment whatsoever. 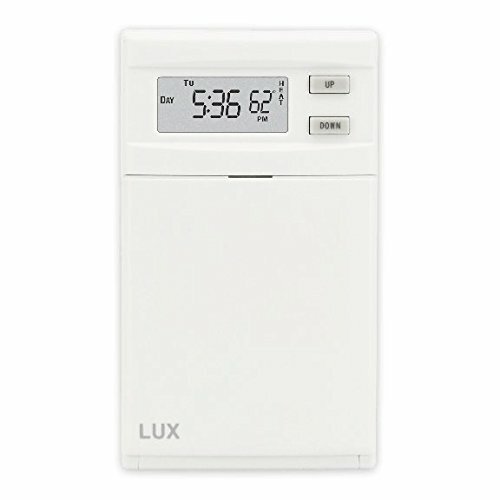 FUNCTION: elago Lock Case restricts the use of the dial, only allowing the front of the Thermostat to be visible to the public. While locked, changes in the Nest Thermostat can only be made through the app. "THIS IS WHAT YOU NEED The electrical switches was made of the leading quality with vastly benefits that others products don't have. Therefore we believe that this items will definitely satisfy your need!" WIDE APPLICATION: It is suitable for residential and commercial areas, the light switch can be installed in a multitude of locations at homes, offices, business buildings, schools, etc. SAFETY GUARANTEE: Electrical switch is made of fire-retardant material which is to guarantee secure and reliable working. Overloading and overheating will be supported for your safety. EXCEPTIONAL QUALITY: We use premium materials not found in other lesser quality imitation products you will see. Our switches are made to strict trade-secret standards and pass a rigorous inspection. Our dimmers are manufactured to nationally recognized standards for safety. BUY NOW -- We are start-up so we ensure to provide our customers the high quality and convenient products. Don't hesitate to click ADD-TO-CART so not to miss this perfect product line. NOTE: Our normal delivery time is within 15-20 days. If you ordered our item, we can not cancel your order which is being shipped on the way.